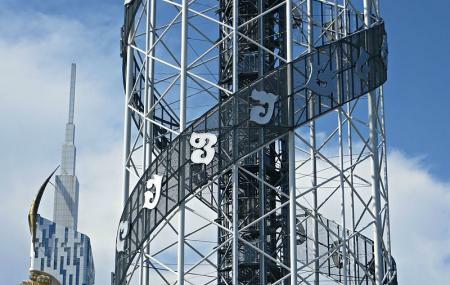 If you want to bask in a bird’s eye view of the city atop a 130-meter-high structure, the Alphabetic Tower is the place to go. Symbolizing the distinctiveness of the Georgian alphabet and people, this is an interesting take on the city’s evolving architecture. Designed in the shape of a DNA, in its familiar double helix pattern, the two helix bands ascend the tower holding 33 letters of the Georgian alphabet, each being 4 meters tall. These alphabets made of aluminum are a sight in their own! Taking you up towards the crown of the tower is an exposed elevator shaft, that also serves beguiles you with breathtaking views of what’s next to come. As you reach the top of the tower, you will encounter a gigantic silver ball, that will leave you further awestruck. This iconic building plays peek-a-boo with you as you venture through the city’s other attractions. Climb up the tower to see beautiful views of the Black Sea and the city. Post sunset, unless you just want to feel the breeze, you cannot enjoy the views this tower offers. 09:00 pm onwards entrance is free. How popular is Alphabetic Tower? People normally club together Colonnades and Monument Ali And Nino while planning their visit to Alphabetic Tower.